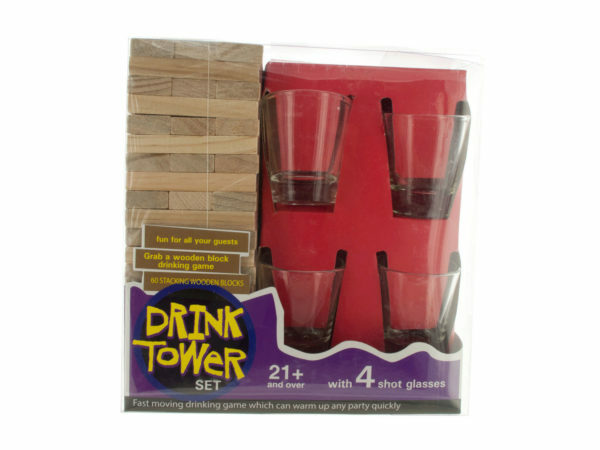 Warm up any party quickly with this fast-moving Drink Tower Wooden Block Drinking Game featuring stacking wooden blocks printed with various drinking instructions and shot glasses to fill with your favorite spirits. Includes 60 wooden blocks and 4 shot glasses. For 21+. Play directions included on back of package. Comes packaged in an individual box. Box measures approximately 7.5" x 3" x 8".